Back in May of 1962 a gang of fiddlers from Idaho hopped on a bus and rode to Seattle to perform for the World’s Fair. They played music all the way and, so I’m told, raised some heck when they got there. Don Gish, Manny Shaw, Rusty Modrell and Bill Yohey were among the many fine Idaho based musicians who graced the stage. Otis Howard was on hand too and played a spritely hoedown he had penned and which he dubbed Century 21 Hoedown. Art Nation and Phil Williams preserved this amazing concert on tape. 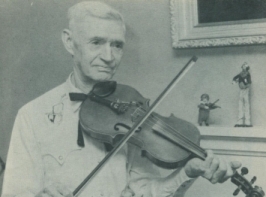 Mr. Howard was one of the Charter members of the Idaho Old Time Fiddlers Association and had a long history of playing the fiddle and banjo for dances in the mining and ranching communities of southern Idaho. He was born in Colorado in 1887 and rode a covered wagon to Idaho with his family while still quite young. Times were tough and the family made a little extra money playing music wherever they could. His father, an uncle who was blind, four brothers and two sisters all played. Otis absorbed a substantial repertoire of traditional tunes and composed quite a few others: hoedowns and waltzes along with a substantial selection of quite elegant schottisches. When he finished his schooling in Mountain Home he joined his father in driving horse and mule drawn freight wagons. He later drove stage coaches. In fact, his son recalls, he much preferred horses to those noisy and smelly automobiles and only begrudgingly learned to drive one later in life. Dave Frisbee, also a fine Idaho fiddler and guitar player, recorded Otis in 1963 and you can order this music on a cd put out by the Idaho Songs Project at www.bonafidaho.com/idahosongs.htm. Gary Eller is in charge of that one and we thank him for permission to use the recording of Otis’ Century Twenty One (or just plain Century) Hoedown.